This article is about the molecule. For other uses, see Buckyball (disambiguation). Buckminsterfullerene derives from the name of the noted futurist and inventor Buckminster Fuller. One of his designs of a geodesic dome structure bears great resemblance to C60; as a result, the discoverers of the allotrope named the newfound molecule after him. 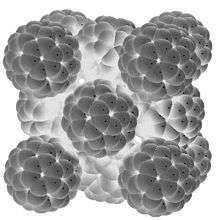 The general public, however, sometimes refers to buckminsterfullerene, and even Fuller's dome structure, as buckyballs. The structure associated with fullerenes was described by Leonardo da Vinci. Albrecht Dürer also reproduced a similar icosahedron containing 12 pentagonal and 20 hexagonal faces but there are no clear documentations of this. Many soccer balls have the same shape as buckminsterfullerene, C60. Theoretical predictions of buckyball molecules appeared in the late 1960s – early 1970s, but they went largely unnoticed. 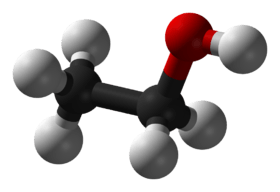 In the early 1970s, the chemistry of unsaturated carbon configurations was studied by a group at the University of Sussex, led by Harry Kroto and David Walton. In the 1980s a technique was developed by Richard Smalley and Bob Curl at Rice University, Texas to isolate these substances. They used laser vaporization of a suitable target to produce clusters of atoms. Kroto realized that by using a graphite target, any carbon chains formed could be studied. Another interesting fact is that, at the same time, astrophysicists were working along with spectroscopists to study infrared emissions from giant red carbon stars. Smalley and team were able to use a laser vaporization technique to create carbon clusters which could potentially emit infrared at the same wavelength as had been emitted by the red carbon star. 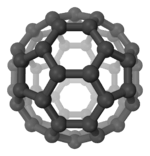 Hence, the inspiration came to Smalley and team to use the laser technique on graphite to create the first fullerene molecule. C60 was discovered in 1985 by Robert Curl, Harold Kroto and Richard Smalley. Using laser evaporation of graphite they found Cn clusters (where n>20 and even) of which the most common were C60 and C70. A solid rotating graphite disk was used as the surface from which carbon was vaporized using a laser beam creating hot plasma that was then passed through a stream of high-density helium gas. The carbon species were subsequently cooled and ionized resulting in the formation of clusters. Clusters ranged in molecular masses but Kroto and Smalley found predominance in a C60 cluster that could be enhanced further by letting the plasma react longer. [3, 6] They also discovered that the C60 molecule formed a cage-like structure, a regular truncated icosahedron. For this discovery they were awarded the 1996 Nobel Prize in Chemistry. The discovery of buckyballs was surprising, as the scientists aimed the experiment at producing carbon plasmas to replicate and characterize unidentified interstellar matter. Mass spectrometry analysis of the product indicated the formation of spheroidal carbon molecules. Another paper on the characterization and verification of the molecular structure followed on in the same year (1990) from their thin film experiments, and detailed also the extraction of an evaporable as well as benzene soluble material from the arc-generated soot. This extract had TEM and X-ray crystal analysis consistent with arrays of spherical C60 molecules, approximately 1.0 nm in van der Waals diameter as well as the expected molecular mass of 720 u for C60 (and 840 u for C70) in their mass spectra. The method was simple and efficient to prepare the material in gram amounts per day (1990) which has boosted the fullerene research and is even today applied for the industrial production of fullerenes. Alternatively, soot is produced by laser ablation of graphite or pyrolysis of aromatic hydrocarbons. Fullerenes are extracted from the soot using a multistep procedure. First, the soot is dissolved in appropriate organic solvents. This step yields a solution containing up to 75% of C60, as well as other fullerenes. These fractions are separated using chromatography. Generally, the fullerenes are dissolved in hydrocarbon or halogenated hydrocarbon and separated using alumina columns. The versatility of fullerene molecules has led to a large amount of research exploring their properties. One interesting property is the relatively large volume of the internal space of the molecule. Atoms of different elements may be placed inside the molecular cage formed by the carbon atoms. Beam-experiments conducted between 1985 and 1990 provided more evidence for the stability of C60 while supporting the closed-cage structural theory and predicting some of the bulk properties such a molecule would have. Around this time, intense theoretical group theory activity also predicted that C60 should have only four IR-active vibrational bands, on account of its icosahedral symmetry. 60 molecule is extremely stable, withstanding high temperatures and high pressures. The exposed surface of the structure can selectively react with other species while maintaining the spherical geometry. Atoms and small molecules can be trapped within the molecule without reacting. In solid buckminsterfullerene, the molecules C60 stick together via the van der Waals forces in the fcc (face-centered cubic) motif. At low temperatures the individual molecules are locked against rotation. Upon heating, they start rotating at about −20 °C. This results in a first-order phase transition to a fcc structure and a small, yet abrupt increase in the lattice constant from 1.411 to 1.4154 nm. 60 forms a brownish solid with an optical absorption threshold at ≈1.6 eV. It is an n-type semiconductor with a low activation energy of 0.1–0.3 eV; this conductivity is attributed to intrinsic or oxygen-related defects. Fcc C60 contains voids at its octahedral and tetrahedral sites which are sufficient large (0.6 and 0.2 nm respectively) to accommodate impurity atoms. When alkali metals are doped into these voids, C60 converts from a semiconductor into a conductor or even superconductor. 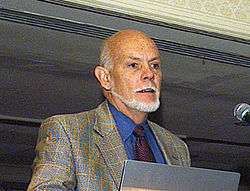 In 1991, Haddon et al. found that intercalation of alkali-metal atoms in solid C60 leads to metallic behavior. In 1991, it was revealed that potassium-doped C60 becomes superconducting at 18 K. This was the highest transition temperature for a molecular superconductor. Since then, superconductivity has been reported in fullerene doped with various other alkali metals. It has been shown that the superconducting transition temperature in alkaline-metal-doped fullerene increases with the unit-cell volume V. As caesium forms the largest alkali ion, caesium-doped fullerene is an important material in this family. Recently, superconductivity at 38 K has been reported in bulk Cs3C60, but only under applied pressure. The highest superconducting transition temperature of 33 K at ambient pressure is reported for Cs2RbC60. The increase of transition temperature with the unit-cell volume had been believed to be evidence for the BCS mechanism of C60 solid superconductivity, because inter C60 separation can be related to an increase in the density of states on the Fermi level, N(εF). Therefore, there have been many efforts to increase the interfullerene separation, in particular, intercalating neutral molecules into the A3C60 lattice to increase the interfullerene spacing while the valence of C60 is kept unchanged. However, this ammoniation technique has revealed a new aspect of fullerene intercalation compounds: the Mott transition and the correlation between the orientation/orbital order of C60 molecules and the magnetic structure. The C60 molecules compose a solid of weakly bound molecules. The fullerites are therefore molecular solids, in which the molecular properties still survive. The discrete levels of a free C60 molecule are only weakly broadened in the solid, which leads to a set of essentially nonoverlapping bands with a narrow width of about 0.5 eV. For an undoped C60 solid, the 5-fold hu band is the HOMO level, and the 3-fold t1u band is the empty LUMO level, and this system is a band insulator. But when the C60 solid is doped with metal atoms, the metal atoms give electrons to the t1u band or the upper 3-fold t1g band. This partial electron occupation of the band may lead to metallic behavior. However, A4C60 is an insulator, although the t1u band is only partially filled and it should be a metal according to band theory. 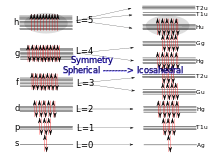 This unpredicted behavior may be explained by the Jahn–Teller effect, where spontaneous deformations of high-symmetry molecules induce the splitting of degenerate levels to gain the electronic energy. The Jahn–Teller type electron-phonon interaction is strong enough in C60 solids to destroy the band picture for particular valence states. A narrow band or strongly correlated electronic system and degenerated ground states are important points to understand in explaining superconductivity in fullerene solids. When the inter-electron repulsion U is greater than the bandwidth, an insulating localized electron ground state is produced in the simple Mott–Hubbard model. This explains the absence of superconductivity at ambient pressure in caesium-doped C60 solids. Electron-correlation-driven localization of the t1u electrons exceeds the critical value, leading to the Mott insulator. The application of high pressure decreases the interfullerene spacing, therefore caesium-doped C60 solids turn to metallic and superconducting. A fully developed theory of C60 solids superconductivity is still lacking, but it has been widely accepted that strong electronic correlations and the Jahn–Teller electron–phonon coupling produce local electron-pairings that show a high transition temperature close to the insulator–metal transition. Solutions of C60 can be oxygenated to the epoxide C60O. 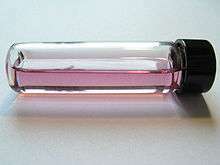 Ozonation of C60 in 1,2-xylene at 257K gives an intermediate ozonide C60O3, which can be decomposed into 2 forms of C60O. Decomposition of C60O3 at 296 K gives the epoxide, but photolysis gives a product in which the O atom bridges a 5,6-edige. The paramagnetic fulleride ion [C60]2− has been isolated as the [K(crypt-222)]+ salt. 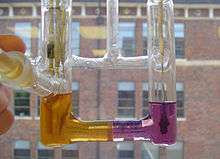 It is synthesized by treating C60 with metallic potassium in the presence of 2.2.2-cryptand. The most common fulleride ion, however, is [C60]3−. Alkali metal salts of this trianion are superconducting. In M3C60 (M = Na, K, Rb), the M+ ions occupy the interstitial holes in a lattice composed of ccp lattice composed of nearly spherical C60 anions. In Cs3C60, the cages are arranged in a bcc lattice. No application of C60 has been commercialized. In the medical field, elements such as helium (that can be detected in minute quantities) can be used as chemical tracers in impregnated buckyballs. ↑ Eiji Ōsawa (2002). Perspectives of fullerene nanotechnology. Springer. pp. 275–. ISBN 978-0-7923-7174-8. Retrieved 26 December 2011. ↑ Kroto, H. W.; Heath, J. R.; O'Brien, S. C.; Curl, R. F.; Smalley, R. E. (1985). 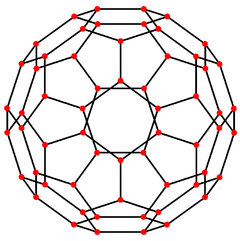 "C60: Buckminsterfullerene". Nature. 318 (6042): 162–163. Bibcode:1985Natur.318..162K. doi:10.1038/318162a0. ↑ Howard, Jack B.; McKinnon, J. Thomas; Makarovsky, Yakov; Lafleur, Arthur L.; Johnson, M. Elaine (1991). "Fullerenes C60 and C70 in flames". Nature. 352 (6331): 139–41. Bibcode:1991Natur.352..139H. doi:10.1038/352139a0. PMID 2067575. ↑ Howard, J; Lafleur, A; Makarovsky, Y; Mitra, S; Pope, C; Yadav, T (1992). "Fullerenes synthesis in combustion". Carbon. 30 (8): 1183–1201. doi:10.1016/0008-6223(92)90061-Z. ↑ Staff (22 February 2012). "Tiny 'Soccer Ball' Space Molecules Could Equal 10,000 Mount Everests". Space.com. Retrieved 23 February 2012. ↑ Arndt, Markus; Nairz, Olaf; Vos-Andreae, Julian; Keller, Claudia; Van Der Zouw, Gerbrand; Zeilinger, Anton (1999). "Wave–particle duality of C60". Nature. 401 (6754): 680–2. Bibcode:1999Natur.401..680A. doi:10.1038/44348. PMID 18494170. ↑ The AZo Journal of Materials Online. AZoM™.com. "Buckminsterfullerene." 2006. Retrieved Jan 4. 2011. ↑ Durer, A. (1471–1528). "German artist who made an early model of a regular truncated icosahedron". 1 2 3 4 Dresselhaus, M. S.; Dresselhaus, G.; Eklund, P. C. (1996). Science of fullerenes and carbon nanotubes. San Diego, CA: Academic Press. ISBN 012-221820-5. ↑ Herbig, E. (1975). "The diffuse interstellar bands. IV - the region 4400-6850 A". Astrophys. J. 196: 129. Bibcode:1975ApJ...196..129H. doi:10.1086/153400. ↑ Leger, A.; d'Hendecourt, L.; Verstraete, L.; Schmidt, W. (1988). 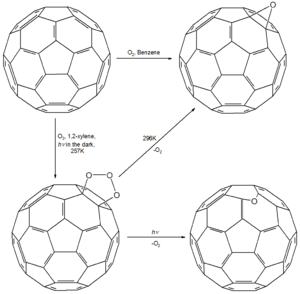 "Remarkable candidates for the carrier of the diffuse interstellar bands: C60+ and other polyhedral carbon ions". Astron. Astrophys. 203: 145. Bibcode:1988A&A...203..145L. ↑ Dietz, T. G.; Duncan, M. A.; Powers, D. E.; Smalley, R. E. (1981). "Laser production of supersonic metal cluster beams". J. Chem. Phys. 74 (11): 6511. Bibcode:1981JChPh..74.6511D. doi:10.1063/1.440991. 1 2 Kroto, H. W.; Health, J. R.; O'Brien, S. C.; Curl, R. F.; Smalley, R. E. (1985). "C60: Buckminsterfullerene". Nature. London. 318 (6042): 162–163. Bibcode:1985Natur.318..162K. doi:10.1038/318162a0. ↑ Conference proceedings of "Dusty Objects in the Universe", page 89–93, "Search for the UV and IR spectra of C60 in laboratory-produced carbon dust"
1 2 3 Buckminsterfullerene, C60. University of Bristol. Chm.bris.ac.uk (1996-10-13). Retrieved on 2011-12-25. ↑ Solid C60 – a new form of carbon. ↑ Shriver and Atkins. Inorganic Chemistry (Fifth Edition). W. H. Freeman and Company, New York, 2010, pp 356. ↑ Baati, Tarek; Moussa, Fathi (June 2012). "The prolongation of the lifespan of rats by repeated oral administration of fullerene". Biomaterials. 33 (19): 4936–4946. doi:10.1016/j.biomaterials.2012.03.036. PMID 22498298. ↑ Moussa, Loera (Director) (8 October 2012). Full Interview With Professor Fathi Moussa (Television production). Paris: Loera, C60.NET. ↑ Ruoff, R. S.; Tse, Doris S.; Malhotra, Ripudaman; Lorents, Donald C. (1993). 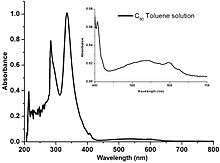 "Solubility of fullerene (C60) in a variety of solvents". Journal of Physical Chemistry. 97 (13): 3379–3383. doi:10.1021/j100115a049. ↑ M. S. Dresselhaus; G. Dresselhaus; P. C. Eklund (20 February 1996). Science of fullerenes and carbon nanotubes. Academic Press. pp. 437–. ISBN 978-0-12-221820-0. Retrieved 26 December 2011. ↑ Haddon, R. C.; Hebard, A. F.; Rosseinsky, M. J.; Murphy, D. W.; Duclos, S. J.; Lyons, K. B.; Miller, B.; Rosamilia, J. M.; Fleming, R. M.; Kortan, A. R.; Glarum, S. H.; Makhija, A. V.; Muller, A. J.; Eick, R. H.; Zahurak, S. M.; Tycko, R.; Dabbagh, G.; Thiel, F. A. (1991). "Conducting films of C60 and C70 by alkali-metal doping". Nature. 350 (6316): 320–322. Bibcode:1991Natur.350..320H. doi:10.1038/350320a0. 1 2 Gunnarsson, O. (1997). "Superconductivity in fullerides". Reviews of Modern Physics. 69 (2): 575–606. arXiv:cond-mat/9611150 . Bibcode:1997RvMP...69..575G. doi:10.1103/RevModPhys.69.575. ↑ Hebard, A. F.; Rosseinsky, M. J.; Haddon, R. C.; Murphy, D. W.; Glarum, S. H.; Palstra, T. T. M.; Ramirez, A. P.; Kortan, A. R. (1991). "Superconductivity at 18 K in potassium-doped C60". Nature. 350 (6319): 600–601. Bibcode:1991Natur.350..600H. doi:10.1038/350600a0. ↑ Rosseinsky, M.; Ramirez, A.; Glarum, S.; Murphy, D.; Haddon, R.; Hebard, A.; Palstra, T.; Kortan, A.; Zahurak, S.; Makhija, A. (1991). "Superconductivity at 28 K in RbxC60". Physical Review Letters. 66 (21): 2830–2832. Bibcode:1991PhRvL..66.2830R. doi:10.1103/PhysRevLett.66.2830. PMID 10043627. ↑ Chen, C.-C.; Kelty, S. P.; Lieber, C. M. (1991). "(RbxK1−x)3C60 Superconductors: Formation of a Continuous Series of Solid Solutions". Science. 253 (5022): 886–8. Bibcode:1991Sci...253..886C. doi:10.1126/science.253.5022.886. PMID 17751824. ↑ Zhou, O.; Zhu, Q.; Fischer, J. E.; Coustel, N.; Vaughan, G. B. M.; Heiney, P. A.; McCauley, J. P.; Smith, A. B. (1992). "Compressibility of M3C60 Fullerene Superconductors: Relation Between Tc and Lattice Parameter". Science. 255 (5046): 833–5. Bibcode:1992Sci...255..833Z. doi:10.1126/science.255.5046.833. PMID 17756430. ↑ Brown, Craig; Takenobu, Taishi; Kordatos, Konstantinos; Prassides, Kosmas; Iwasa, Yoshihiro; Tanigaki, Katsumi (1999). "Pressure dependence of superconductivity in the Na2Rb0.5Cs0.5C60 fulleride". Physical Review B. 59 (6): 4439–4444. Bibcode:1999PhRvB..59.4439B. doi:10.1103/PhysRevB.59.4439. 1 2 Ganin, Alexey Y.; Takabayashi, Yasuhiro; Khimyak, Yaroslav Z.; Margadonna, Serena; Tamai, Anna; Rosseinsky, Matthew J.; Prassides, Kosmas (2008). "Bulk superconductivity at 38 K in a molecular system". Nature Materials. 7 (5): 367–71. Bibcode:2008NatMa...7..367G. doi:10.1038/nmat2179. PMID 18425134. ↑ Tanigaki, K.; Ebbesen, T. W.; Saito, S.; Mizuki, J.; Tsai, J. S.; Kubo, Y.; Kuroshima, S. (1991). "Superconductivity at 33 K in CsxRbyC60". Nature. 352 (6332): 222–223. Bibcode:1991Natur.352..222T. doi:10.1038/352222a0. 1 2 Iwasa, Y; Takenobu, T (2003). "Superconductivity, Mott Hubbard states, and molecular orbital order in intercalated fullerides". Journal of Physics: Condensed Matter. 15 (13): R495. Bibcode:2003JPCM...15R.495I. doi:10.1088/0953-8984/15/13/202. ↑ Erwin, Steven; Pederson, Mark (1991). "Electronic structure of crystalline K6C60". Physical Review Letters. 67 (12): 1610–1613. Bibcode:1991PhRvL..67.1610E. doi:10.1103/PhysRevLett.67.1610. ↑ Erwin, Steven; Pederson, Mark (1993). "Electronic structure of superconducting Ba6C60". Physical Review B. 47 (21): 14657–14660. arXiv:cond-mat/9301006 . Bibcode:1993PhRvB..4714657E. doi:10.1103/PhysRevB.47.14657. ↑ Han, J.; Gunnarsson, O.; Crespi, V. (2003). "Strong Superconductivity with Local Jahn–Teller Phonons in C60 Solids". Physical Review Letters. 90 (16): 167006. Bibcode:2003PhRvL..90p7006H. doi:10.1103/PhysRevLett.90.167006. PMID 12731998. ↑ Capone, M.; Fabrizio, M; Castellani, C; Tosatti, E (2002). "Strongly Correlated Superconductivity". Science. 296 (5577): 2364–6. arXiv:cond-mat/0207058 . Bibcode:2002Sci...296.2364C. doi:10.1126/science.1071122. PMID 12089436. 1 2 3 4 5 6 7 Catherine E. Housecroft; Alan G. Sharpe (2008). "Chapter 14: The group 14 elements". Inorganic Chemistry, 3rd Edition. Pearson. ISBN 978-0-13-175553-6. ↑ Zhao, Yufeng; Kim, Yong-Hyun; Dillon, A. C.; Heben, M. J.; Zhang, S. B. (22 April 2005). "Hydrogen Storage in Novel Organometallic Buckyballs" (PDF). Physical Review Letters. 94 (15): 155504. Bibcode:2005PhRvL..94o5504Z. doi:10.1103/PhysRevLett.94.155504. Retrieved 24 September 2012. 1 2 Jonathan W. Steed & Jerry L. Atwood (2009). Supramolecular Chemistry, 2nd edition. Wiley. ISBN 978-0-470-51233-3. ↑ Ryuichi, Mitsumoto (1998). "Electronic Structures and Chemical Bonding of Fluorinated Fullerenes Studied". J. Phys. Chem. A. 102 (3): 552–560. doi:10.1021/jp972863t.